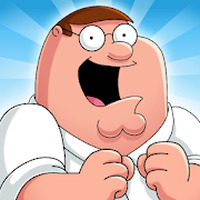 "An entertaining game based on Family Guy for your mobile"
Game Goal: In Family Guy you have to help Peter Griffin rebuild their city, Quahog. You need to complete small tasks to bring back not only the houses but also the inhabitants. How to play: Complete every challenge to manage to raise the money for the reconstruction of Quahog. Graphics: Great accuracy, very good 3D sceneries, wide variety of buildings with great attention to detail. Game play: Interesting thanks to the many game options. Controls: Uses the tactile screen. Content Classification: Ideal for fans of the Family Guy show. Platform: Works with Android phones and tablets. Requirements: Compatible with Android 2.3.3 or higher. Argument: After a battle against the Giant Chicken, Peter Griffin accidentally destroyed Quahog; now you need to work to get it back. Developer: TinyCo is based in United States	- One of the most prominent developers on Android Market. Installation requirements: A minimum of 54.52 MB of free memory space and Android 2.3.3 or higher. Some of the game options are paid. Do you like Family Guy The Quest for Stuff?